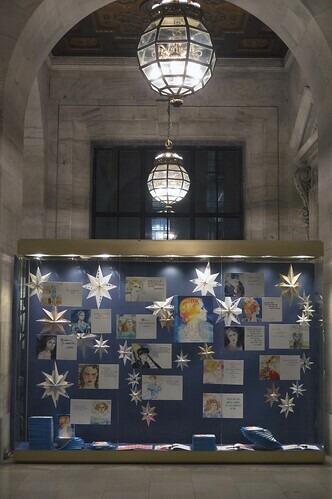 I’m beyond excited to share an exhibit the NYPL asked me to create featuring my book and beautiful paper star sculptures by Eloise Corr Danch. Read about the whole project here. The window is dazzling. 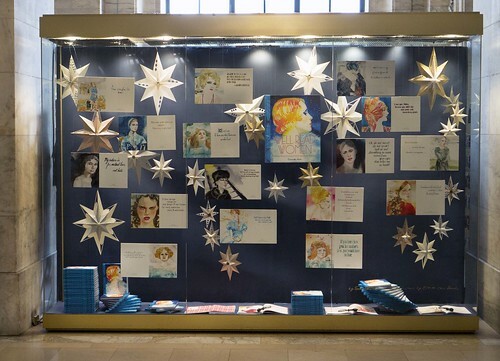 The beautiful illustrations paired with detailed stars is perfect. I cannot imagine a more thrilling location to display your book! Looks beautiful. Hoping to check it out in person. Hannah, there’s a great kid’s book exhibit on the main floor right next to my window display and the bookshop. You can take Dino (there’s also, of course the great kid’s section). We plan to take Henry to the ABC exhibt. I’m sure he’ll love it. We’ll also show him the showcase which he’ll be unimpressed by of course. Guauuu!! Great work!! The mix illustration with starts is gorgeous ;D Kisses from Madrid!! Everyday I learn something new with your blog ;D Muá! !